Trying to make up for a crappy meal at Destino, we headed to the lounge at Absinthe, for dessert. Adding to our night of failures, they were out of our #1 dessert choice. So, we somehow ended up getting a whole crab instead (and a dessert of course). It was crab season after all! Overall it was all good, but nothing special. But keep in mind that I'm spoiled because I've been feasting on crab every weekend at home with pretty much this same preparation for a fraction of the cost. And the desserts I eat daily at work are better than this, particularly the chocolate mousses and German chocolate cakes. So ... this just didn't strike me as worth it. The lounge area was a nice mix of formal but comfortable, lively but quiet enough to hold a conversation, and offered the bar menu, the full menu, and dessert menu, so we could easily create our ridiculous "dessert" courses. A nice mix, but as it is out of the way from places I normally frequent, I'm not sure when I'd really find myself back there. Chilled Whole Dungeness Crab. $30. So we went for dessert. And then when they were out of what we wanted, we had to improvise. So ... we started with a whole crab, served with some delicious butter sauces and lemon wedges. The crab was good, but at the end of the day, it was just a plain cooked crab, not really any different than what I get for 1/3 the price at the farmer's market every week. The warm butter sauce was fine, but again, I can have that at home. The other sauce (some kind of Béarnaise perhaps?) was pretty delicious and definitely a value add. My favorite was the body meat, nice and sweet and delicious even without the sauce. Mmm, crab! German chocolate cake: milk chocolate mousse, pressed coconut, coconut whipped cream, candied pecans, caramel sauce. $10. This was listed on the menu as "German Chocolate Cake", but was totally not what we expected. Sorry for the poor photo, we were too eager to dig into it for me to slow down and take a proper photo! The white stuff is coconut whipped cream, and it was delicious. The candied pecans were a nice touch, as I'm a sucker for pecans. And it is hard to see, but there is a delicious caramel sauce drizzled over it. The main dessert was a layer of sweetened, pressed coconut, topped with a layer of chocolate cake, all generously enrobed in chocolate mousse. The cake itself was forgettable, but the mousse was pretty awesome. A very different take on German chocolate cake for sure, but all of the key flavors were still highlighted, and this was enjoyable. But as I said, I'm spoiled, and get better chocolate cake and chocolate mousse at work pretty regularly. Yes, I've got a thing for Rubio's. Yes, it is out of character, as it is cheap, casual, Mexican food. But not entirely out of character, as what I love is the sauces and the seafood. Anyway, around this time of year every year, they have a limited time special: the Langostino Lobster taco (or burrito). Since only discovered Rubio's a few months ago, I hadn't ever experienced it before, but had heard about it. So when it came back on the menu, I had to try it out. The first thing I noticed was the branding. Everywhere it clearly said "Langostino Lobster". I just figured it was a special type of lobster, but looked it up online to be sure. Turns out ... not lobster at all. They are tiny little crustaceans more closely related to hermit crabs. And, Rubio's had a class action lawsuit filed against them a few years ago for marketing them as "lobster", hence, the excessive labeling now. I didn't really care if it was real lobster or not, as I actually don't love lobster. I greatly prefer local crab. Or even shrimp or prawns if well prepared. But ... it wasn't that great. Since I've reviewed Rubio's so many times before, I'm skipping all the details on the establishment, and just reviewing this single dish. 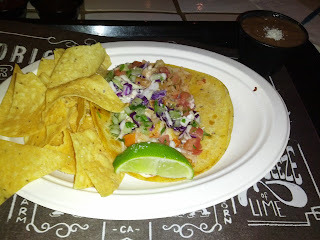 Langostino Lobster Taco, Chips, "No Fried" Pinto Beans. $4.29. The langostino lobster taco is described as "Tender Langostino Lobster served with handmade guacamole, creamy chipotle sauce, salsa fresca, red and green cabbage, and a cilantro/onion mix. Served on a warm stone-ground corn torilla and garnished with a slice of lime." Of course, since I am allergic to avocado, I had to leave a major component out: the guacamole When I asked to have it left out, the woman taking my order asked what I'd like instead. She suggested cheese or sour cream. I didn't really want to add cheese to my lobster (seafood and cheese don't seem to be a great pairing most of the time), and since there was already the creamy chipotle sauce I didn't want to add the sour cream. So I said that it was fine to just leave it out and not substitute anything. She then suggested rice. I said sure. In retrospect this was not a good idea, since I don't really like rice, but I was caught off guard and just went along with it. When she brought me my order, she also added on a side of the beans and chips, since they felt bad that I didn't have the guacamole, which is normally an expensive component (apparently, you can always add rice in for free). Anyway. The tortilla was the same corn tortilla shell I've had on previous visits, but this time, it was much crispier. It had the same great corn flavor, and at first I didn't like the crispness as I thought it was stale, but it grew on me, and I ended up liking this crunchier version. Not really sure why it was so different this time, normally it is soft and moist, seemingly steamed rather than grilled. I enjoyed the tortilla, and used the extra pieces to dunk into salsa. The "lobster" came in little pieces. They were tender, well cooked, with a slightly grilled flavor. One or two of them seemed a little fishy. Of all of the proteins I've tried at Rubio's, this was the least remarkable. I greatly preferred the shrimp, the talapia, the mahi, even the fried pollock. I think part of the problem was that the lobster was lost in all of the rice. The rice was moist, flavorful, but there was a lot of it, and it doesn't normally belong in a taco. It turned it more into a burrito. But even without the rice, the lobster just wasn't anything special. The creamy chipotle sauce, like every other time I've tried it, was amazing. Creamy, with a nice kick. It again made the entire thing delicious. The salsa fresca was not as good as in past visits, the tomato cubes seemed less ripe, less flavorful. This makes sense, as it is no longer tomato season. The cabbages, cilantro, and onion filled out the taco, were fresh and crisp, but not remarkable. I've been spoiled from trying some of their other tacos that have the serrano slaw instead, which is far more flavorful. It was garnished with a juicy lime, which added a nice acidity and citrus note. Additional limes were available in the condiments bar. This time, I also tried some of the pickled carrots from the bar. They were crunchy and insanely spicy. I'd definitely add these in again. This is their most expensive taco, at $4.29. I'm assuming this is due to the guacamole and the lobster. It didn't really seem worth that, but again, I didn't have the guac. It was my least favorite of all of the tacos I've tried so far, and I wouldn't get it again. As I mentioned, I also received a side of beans. Not something I'd normally order, and I'd tried them on my first visit and wasn't all that impressed, but I tried them again. Described as "made fresh daily from scratch, seasoned with a dash of garlic and black pepper, and topped with cotija cheese." They were creamy, mostly mushy beans, with a few whole beans remaining. There just wasn't much flavor to them, I didn't taste garlic at all. Like before, I liked the cheese on top. I also received some chips. I hadn't yet tried these out, and I was excited to, mostly because I really like their chipotle salsa, and wanted something to dip into it. The chips are also prepared fresh daily. They were a thin style, slightly salty, not really remarkable. Better than store bought chips, but not as good as Tropisueño.